So we know Chanel was all about the supermarket this season with their incredible set up featuring every sort of Chanel food you could imagine in one place. Well, while Chanel is on their food loving kick, there's one culinary artist in NYC who is riding the trend while it lasts and has created edible Chanel. Last week, Vogue featured Nataly Gonzalez's Chocolate shoes as the perfect hostess gift for the summer. Frankly speaking, why are they limiting this to a hostess gift? 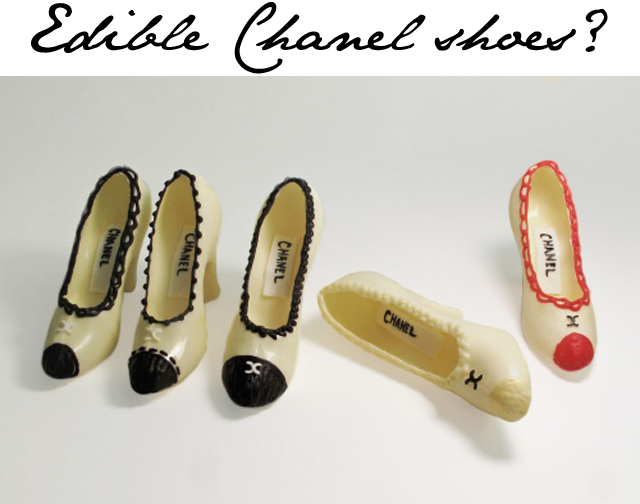 I'm the first to announce that anyone gifting chocolate Chanel shoes will instantly become one of the most important people in my life, whether attending a party I'm hosting or not. Bring on the edible couture, I say. For those of you looking to score a pair of chocolate Chanels, they are currently sold at the Macaron Cafe in NYC.